You are at:Home»Herbs»Cassia angustifolia Vahl. Latin name : Cassia angustifolia Vahl. Description : The leaf is a very effective laxative and purgative and is a particularly useful remedy for the occasional bout of constipation and is useful for evacuation relief in cases of fissures, haemorrhoids, after rectoanal operations, and in preparation of diagnostic intervention in the gastrointestinal tract. It irritates the lining of the large intestine, causing the muscles to contract strongly resulting in bowel movement in about 10 to 12 hours after ingestion and also stops fluid being absorbed from the large bowel helping to keep the stool soft. It is sure and safe even for children (over 12 years of age) and weak and elderly persons. To prevent griping pains in the intestines, it is best when combined with a smaller amount of a warming stimulant and antispasmodic such as ginger or some other suitable herb. Too frequent usage can lead to laxative dependency. Senna leaf is approved by the World Health Organization (WHO) for short-term use in occasional constipation. Senna is also approved in the United States and in European countries as an ingredient in over-the-counter and prescription laxative preparations. The herb is approved by the German government for any condition in which alleviating constipation or softening stools is desirable. The botanical name of senna is Cassia angustifolia. It belongs to family Fabaceaea. Senna is also called Swarn patri in Sanskrit. The herb is a native of Arabian and African countries. It is mostly found in regions having warm climatic conditions. Senna leaves have purgative properties. It can also be used for children, elderly and weak persons. It acts as anthelmintic and can expel intestinal worms. Various skin problems can be treated with senna such as eczema, acne and pimples. 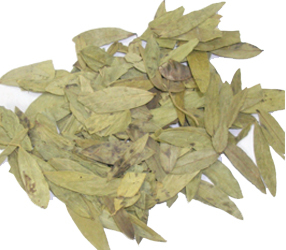 Senna leaves are used in treatment of constipation and biliousness. It is also used to treat rheumatism and gout.